When we did our first Celebri-Cat Cat Friday post, it wasn’t too difficult to come up with at least five pretty viral cats who — we were pretty sure — most readers had at least heard of. The second time, though, for the Celebri-Cat Redux, it was a bit harder and at the time we thought there was no way we’d be able to do another follow up. But, lo and behold, the Internet never ceases to amuse, stun, bewilder and amaze us. We now present to you, dear readers, Celebri-Cats Volume III, in all its furry, full-color glory. A few of these famous felines we actually just came across, and all of them are competing head-to-head in a “Whisker Wars” competition to determine people’s FAVORITE INTERNET CAT OF ALL TIME. I’ve voted a few times so far, and let me tell you — it’s tough to decide. Case in point: Grumpy Cat vs. Colonel Meow. How does one choose one over the other — those dear little mad-faced kitties? The first cat in Volume III would have easily made it to the last two famous cat “who’s who” introductions, had we known about her then. 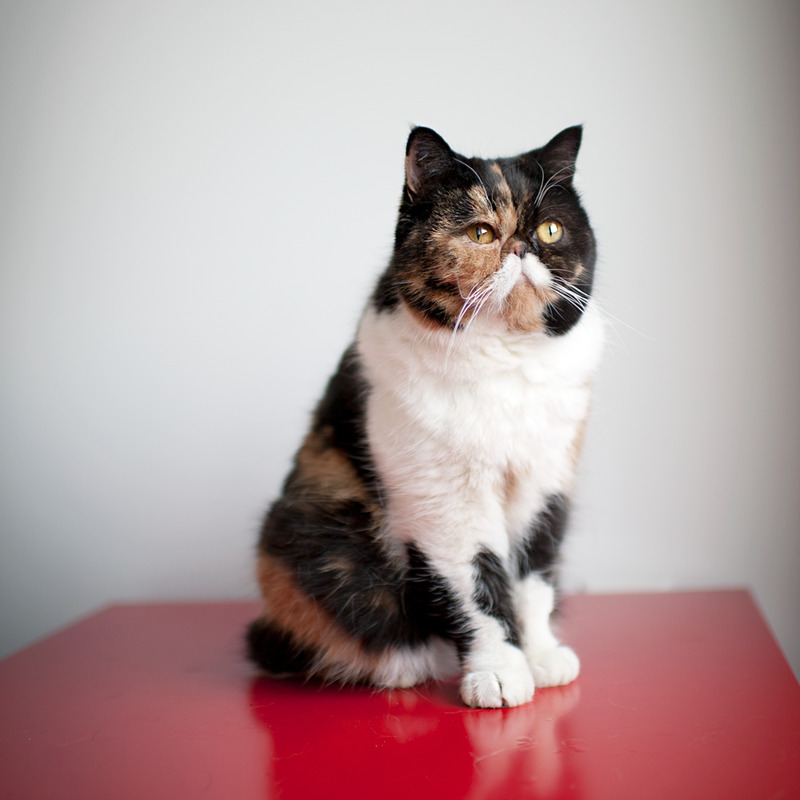 Pudge, who hails from Minneapolis, proclaims on her website that her favorite food is freshly cooked chicken and she loves wand toys because they combine two of her favorite things: sticks and string. And the good news — if Pudge happens to now be your most favorite Internet dwelling cat, you can buy all sorts of goodies with her cute little flat face on it at the Cats of Instagram store. Also, it looks like later this month there will be more merchandise coming to her site (just in time for the holidays!) including tees, calendars, iPhone cases and totes. Next up is a cat that has quite an important job. 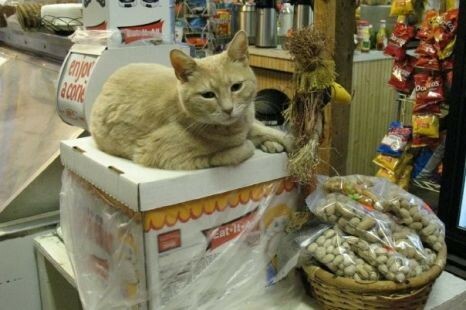 For the past 15 years, this orange tabby has been serving as the mayor of his birthplace — Talkeenta, Alaska. Mayor Stubbs — a manx (he has no tail) — was elected in July 1997 as a write-in candidate in the town of 900… humans, that is. And while he’s only serving as the town’s “honorary” mayor, that doesn’t stop as many as 40 tourists a day from making a pit stop to meet this important cat. Talkeenta, apparently, is just a historic district and not an official town. But whatever the details may be, this cat has a cooler title than lot of people could claim. Stubbs can usually be found napping in his official office, inside the town’s local general store, where he also enjoys drinking catnip-laced water from his own stemmed wine glass and getting belly rubs from his constituents. Across the pond, a brown and white tabby named Larry until very recently played an important role similar to that of Mayor Stubbs. Larry’s office just so happened to be 10 Downing Street, London, aka the British Prime Minister’s headquarters. 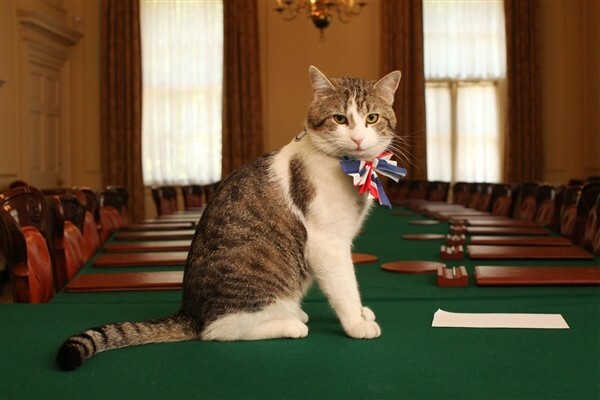 While it’s recently surfaced that Larry’s been sacked from his job as Chief Mouser to the Cabinet Office — apparently due to his nonchalance over the rodent problem there — Larry was at the forefront of cat news for about two years and still remains a resident of 10 Downing Street. Lucky Larry was rescued from a local animal shelter and began serving as the PM’s PM (Prime Mouser, ha ha) starting in early 2011. Before Larry landed his gig, the British media speculated that the Cabinet Office had a rat problem — there were two separate instances of rats running through Downing Street during live TV reports. Larry reportedly killed his first mouse at Downing Street on April 22, 2011. Way to go, Larry. Sadly, though, the few known mouse slayings this cat was able to accomplish after that weren’t enough for the Brit Bosses, and he was replaced only last month by the Chancellor’s cat, Freya. The Chancellor is kind of like the British Veep. While Larry may have slacked off a bit at his former mousing duties, he’s even better at charming the public, press and other political leaders, including President Obama. Larry seemed to really like our Prez despite the fact that he’s been known to show an aversion to males, maybe due to some bad experiences during his past life on the streets. Not only does Larry count the U.S. President as a close friend, he seems to have played a role in increased cat adoptions — by a notable 15 percent — during his first year in residence. More recently, on Oct. 16, it was reported that Larry had a nasty confrontation with his successor, Freya, shortly before she replaced him. 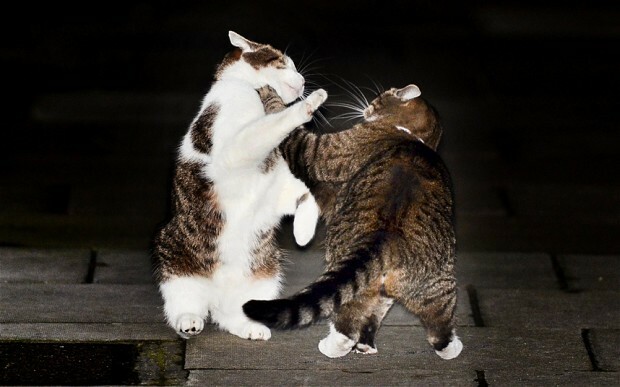 Freya lives next door at 11 Downing Street, and the catfight made headlines after it had to be broken up by police. Before her rise to Top Cat, Feisty Freya had been the Chancellor’s family cat, though she was missing for three years until she turned up in a shelter in June and was thus reunited with the family. To make sure we don’t exhaust our resources of famous cats to introduce you to, we’ll leave you with these three fancy felines this week. Not a bad bunch, though: A four-legged mayor, two almost royal cats and a cat that sort of resembles Uncle Pennybags from Monopoly.